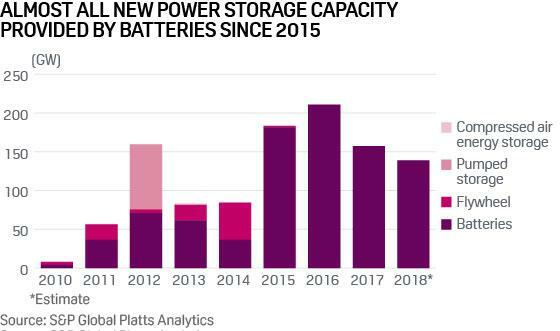 The US currently has a little over 1 GW of installed battery storage capacity and could have more than 7 GW of utility-scale and grid-connected battery storage operating by 2022, according to S&P Global Platts Analytics’ most recent US Power Storage Outlook. Lithium-ion battery prices have sharply declined in recent years driven by steadily expanding manufacturing capacity, which has led to economies of scale and improved learning. That learning curve is expected to continue as battery companies are planning a six-fold manufacturing capacity increase by 2023. Over the medium to longer term, Platts Analytics anticipates that mass-market electric vehicle adoption will continue to drive battery costs down despite concerns around raw material prices. Lithium-ion battery prices are expected to decline 40% by 2025, making it difficult for other technologies such as flow-batteries to compete, particularly for shorter durations. One potential battery storage deployment growth metric lies in the interconnection queues maintained by each wholesale power market operator, known as independent system operators (ISO) or regional transmission organizations (RTO). Any resource that wants to connect to a regional power grid must progress through a formal interconnection process. 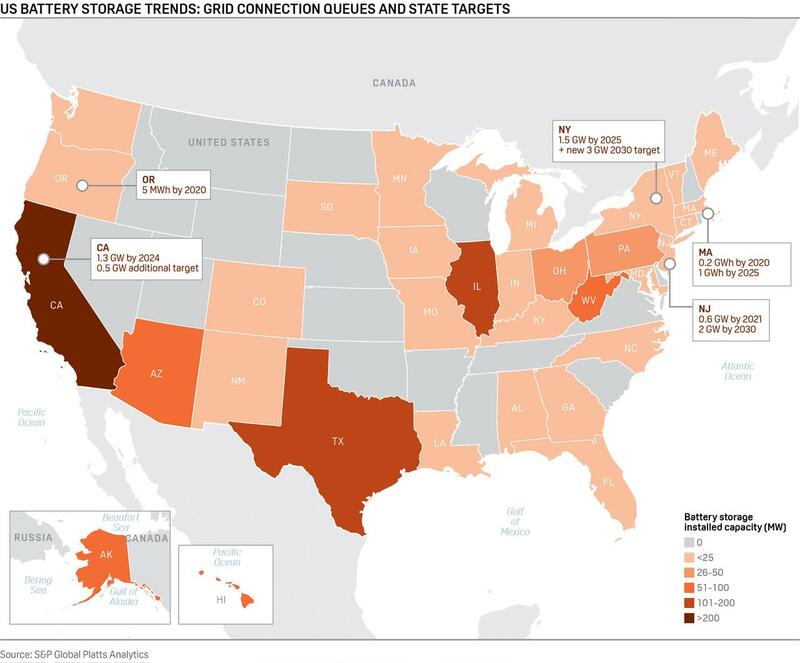 Not every resource will ultimately connect to the grid, but the queues provide a view of the level of market participants’ interest in storage. 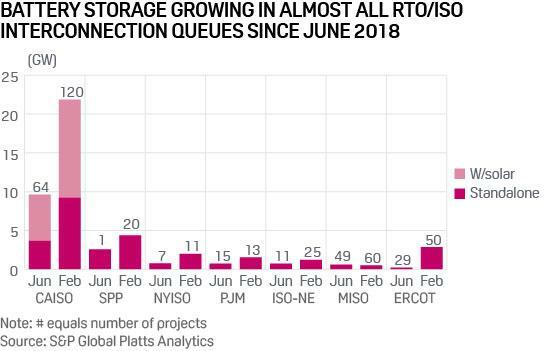 Battery capacity in RTO/ISO interconnection queues more than doubled in 2018, surpassing 30 GW of capacity. The largest queued capacities are in the California ISO (CAISO), supported by storage mandates, and in the Southwest Power Pool (SPP), where several large solar-PV-with-battery projects entered the queue in 2018. The Federal Energy Regulatory Commission’s (FERC) energy storage order 841 will impact the volume of wholesale power market energy storage participation over the longer term, but the impact is expected to vary by region. The ISOs filed plans with FERC detailing market rule changes that would allow energy storage resources to participate in regional power markets on a level playing field with other resources. FERC is reviewing the proposals that were filed in December. Market observers were initially concerned that a 10-hour participation requirement for storage in PJM Interconnection’s proposal would limit the ability of battery storage to engage. PJM Interconnection is an RTO whose territory spans a number of states in the eastern US. However, president and CEO Andy Ott explained in a recent interview that changes to its energy and reserves markets are expected, to allow storage resources to earn the bulk of their revenue from those market segments. The 10-hour requirement only applies to the capacity market, which is not ideal for storage resource participation, according to Ott. Outside those regions covered by RTOs/ISOs, several utilities have announced plans to procure battery storage as part of their Integrated Resource Plan processes. Portland General Electric recently announced a first-of-a-kind combined facility with 300 MW of wind, 50 MW of solar PV and 30 MW of batteries. And Arizona Public Service Company in February said it plans to add 850 MW of battery storage and at least 100 MW of new solar generation by 2025. Platts Analytics estimates that solar PV with storage will become increasingly competitive with natural gas peaking plants in regions with high solar resources.